This year is the 15th Anniversary of fighting game franchise The King of Fighters. To mark the occasion, developer SNK unleashes a "rebirth" for the series, The King of Fighters XII. For those just coming to the series, The King of Fighters XII is a four-button, three-on-three fighter. Unlike Street Fighter, a series KOF is inevitably compared to, there are only two punch buttons (light and heavy) and two kick buttons (ditto). And unlike Capcom's brawler, players select a trio of characters before battling their foes. This system has always given the franchise a faint whiff of chess-like strategy as players try to mix and balance their portfolio of combatants. Since SNK's financial woes caused the company to implode, there's a scrappy underdog quality to the game. The King of Fighters XII, with its lovingly hand-drawn graphics, was supposed to put SNK back on top of the fighting game genre. But is it a knock-out or just punch drunk? Graphics: Since the game is, as SNK has claimed, a rebirth of sorts, the character models were all redrawn by hand. At its very core, this is an old-school arcade fighter — an arcade fighter in an HD world. So, yes, up close, some of the graphics do look pixelated, but that could very well be the point. And since when is pixelated a pejorative term? This game is beautiful. Fighting is fun: It is, it really is. The basic fightinh mechanics are straightforward and intuitive and the new additions like the "Critical Counter" system keeps gameplay evolving during the match. After countering with a heavy punch, the Critical Counter System can cause your health bar to glow green and unleash a series of deadly combos. Likewise, the "Clash System" for when players attack at exactly the same time, causing them to clash and be knocked back to a fighting stance. The line-up of 22 fighters—while skimpier than the majority of KOF games and harboring glaring omissions—is rather balanced, making team building a cinch. Needs more frills: The game is pretty much fighting, and that's pretty much it. There isn't really a story — the semblance of a plot is just that there is a fighting tournament, here is the final match, congratulations, the end. Well, that's totally fine for an arcade title. But if you are playing KOFXII in an arcade, you must likely won't be investing US$60 worth of quarters in the game. The offline single player is an arcade port, but without a proper story mode, the ability to unlock new characters and the addition of only two more fighters, the home console version seems rather light, unfinished even. The entire game is pared down to the fighting. That's the main focus, and that's fine for the arcade title, but at this game's price point, it needs better value for money. Online is a hassle: Since single player is so skimpy, you'd think this game would nail online. Sadly, it doesn't. There are, however, cool and very welcome options like the ability to create a clan. But the simple act of getting online and punching some stranger in the face is far more complicated than it should be. It's sometimes hard to find matches. When we were able to finally get online, there were a few moments were we felt like we were fighting in jelly. Menus are not user friendly: Outside of the main menu, none of the submenus seem intuitive. For example, once you began searching for a match, you cannot leave the pre-fight lobby area — say you cannot find a match or you end up sitting in the lobby area for inordinate amount of time, there is no way to easily leave this lobby. We pressed all the buttons and nothing would happen! Why can't the start button take us out of that menu? Each time we had to turn off the game and sit through the 20 seconds of game credits at the beginning. Know that these are credits that you cannot skip. The fighting in The King of Fighters XII is solid, and the graphics are great. It's as if those are at the expense of everything else, like online multiplayer, story mode, a beefier line-up of fighters and even a worthwhile interface. The King of Fighters XII is definitely a re-birth, but this game is a 15 year franchise in its infancy, finding its feet and learning how to walk again. Is KOF back on top? No. But this latest installment shows the series can eventually make its way back up the hill. 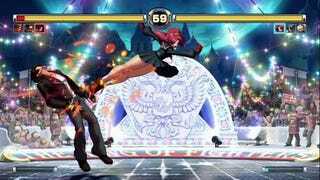 The King of Fighters XII was developed by SNK Playmore and published by Ignition Entertainment for the PlayStation 3 and the Xbox 360 on July 28. Retails for $59.99 USD. Played single player on both platforms to completion as well as online.